To achieve progression we must first adjust our perspectives radically. Henry Ford once stated “If I asked the people what they wanted they would have told me faster horses.”. The same concept can be applied to almost every form of engineering. To think outside the box, replacing the complex with the simple. Creating more reliable and better performing designs. This is the everlasting goal. There are several advancements that can be achieved using the variable pitch prop system. The increase in agility and responsiveness is exponential. Common quadracopter’s use variable speed and direction of a fixed pitched prop to achieve gain in elevation and speed. The problem with this is that in order to change direction of the vehicle the motor must come to a complete stop and start spinning in the opposite direction causing inefficient transfer of force.The Variable pitch system consists of 6 gears with a central geared push rod in the center. The bottom of the shaft of the push rod is a ball and socket type connection with internal bearings. This will allow the top portion (gears and top of push rod) to rotate, while the base of the push rod does not. 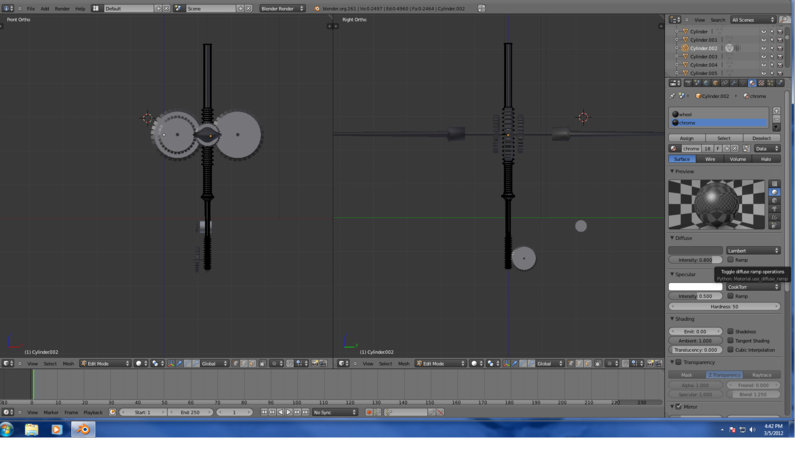 As the push rod travels up and down the main gears that contact the rod will turn. These gears are directly attached to a second set of gears via a centered shaft. These are used to mesh with the gear that is attached directly to the base of the props blade. The blade gears are offset in a way that allows them to remain inline and rotate around a central origin. 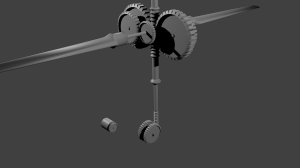 The base of the gear and blade system holds all of the gear and blade assembly. This base plate will attach to an aluminum drive shaft via 5 pan head machine bolts. The drive shaft has a small recess where the belt for the drive system will ride in. The drive shaft’s center is hollow. 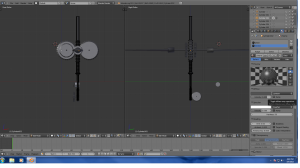 This allows the push rod to travel through the bottom of the drive shaft to the ball and socket connection at the blade assembly. 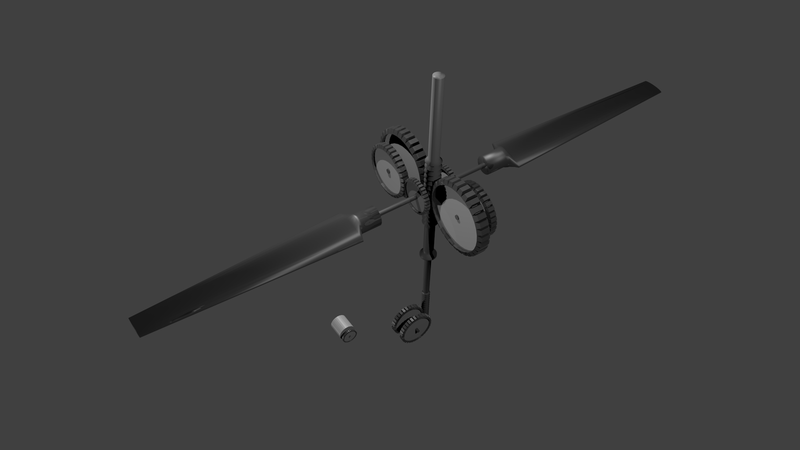 The drive shaft will rest inside the frame of the quadracopter riding on a set of bearings.Since our accent and decent of the vehicle are now being controlled by the pitch of the prop blades there is no longer a need to be able to adjust the speed of the motors individually. The drive shafts will be driven by a belt that is attached to a set of two pulleys mounted directly to the shaft of a single central motor. 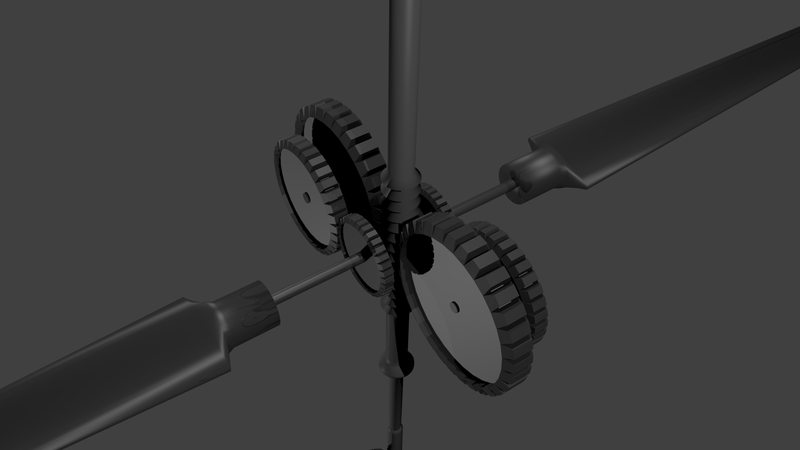 Each pulley on the shaft of the motor will turn two drive shafts. A bearing that rests on a track mounted on the side of the frame can be adjusted by turning a bolt against a stop, creating a basic belt tensioning system. Basic physics will show you that pulling as much weight to the center of an object will allow for more accurate control overall. This is not a new idea, however, this is a good idea. By using a single central motor you not only will center the mass but you will also loose some. The weight loss and added control will allow you to change other design considerations to achieve a greater speed , a higher payload capacity or both. With that in mind we can then look further outside the box into larger scale applications. Perhaps now that we no longer need the accuracy of motor speed to control orientation during flight we could lose the electric motor and go for something of the combustion variety. Replacing the belt and pulley system with sprockets and chains would allow for more torque to be handled. The surface are of the blade can then be increased to move more air past the prop. Using the larger blades for a larger scale application (or a smaller one) would tend to get bulky and potentially dangerous. Utilizing the same chain and sprocket (or belt and pulley in small scale) you can opt to not use a drive shaft at all. 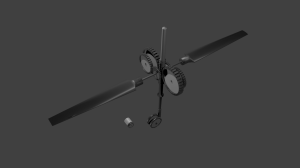 Instead you could contain the blades of the prop into a circular enclosure that acts as the pulley. Allowing the blades to rotate where it meets the outer edge of the enclosure while connected to a similar variable pitch gear system lets the user create a more stream-lined frame. In addition allowing for safety devices (mesh) to be placed over the props.